I’ve been around the sport of triathlon since I was four years old when I did my first Kids of Steel. While I spent my Canadian winters in a hockey arena, I would always do a few triathlons once the hockey season finished. Like many Canadian boys, I wanted to make the NHL and dreamed of being the next Martin Brodeur. But as high school rolled around, I started to get the impression I was becoming better at endurance sports. I even started to do some mountain biking on the side. By grade 10, my motivation for hockey was gone. I was then invited to a Triathlon Ontario development camp with the likes of Alexander Hinton and John Rasmussen (both Canadian ITU athletes). After that camp, I was all in and saw triathlon as an opportunity to become a professional athlete. 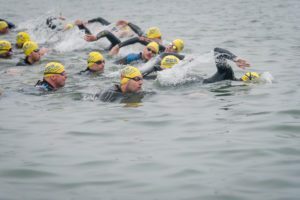 As I began racing at a higher level, it was clear I was a step behind on the swim. I excelled on the bike and run, and had some good results in non-draft legal races. However, in drafting races, I was missing the lead groups and finishing mid-pack. I was also over racing, spending most of my weekends either doing triathlons or mountain bike races (often on the same weekend). In February 2010, my heart went into a rhythm called atrial fibrillation. I was the youngest case my cardiologist had ever seen (Link to full story). Once I recovered, I quickly tried to get back to racing, but the damage was done. My anxiety was not allowing me to sleep or get anywhere close to my potential. By the end of 2010, I called it quits. I applied to school and started to move on with life as a non-athlete. Around this time, I was still getting triathlon magazines. I remember flipping through the pages and seeing Conrad Stolz and Josiah Middaugh racing on mountain bikes in Maui at the Xterra World Championship. It was then that I realized it was possible to compete full-time and make a living doing something I love. As time passed, I began training again and made my pro-Xterra debut in Whistler. At that first race, Josiah Middaugh humbled me, beating me by over 25 minutes. It was the hardest thing I’d ever done, but I instantly felt this is what I need to be doing. So, I did just that. Every decision I was making was around becoming the best cross triathlete I could be. Then in 2016, I had a breakout performance at Xterra Argentina. I finished second overall and was only a minute behind Middaugh. After that result, everything changed. I quit all the jobs I was doing on the side and signed some big sponsorships. Though there have been many ups and downs along the way, I’ve accomplished a lot (four-time Xterra major title winner). Getting to train outdoors in the forest and mountains is amazing, and I wouldn’t trade it for anything in the world. Thanks to the best family, friends, coaches, training partners and companies that support me, I’m able to keep on doing what I love. Hard to say what the future will bring, but when I look back at what I’ve done – and what I can still achieve – it puts a smile on my face.